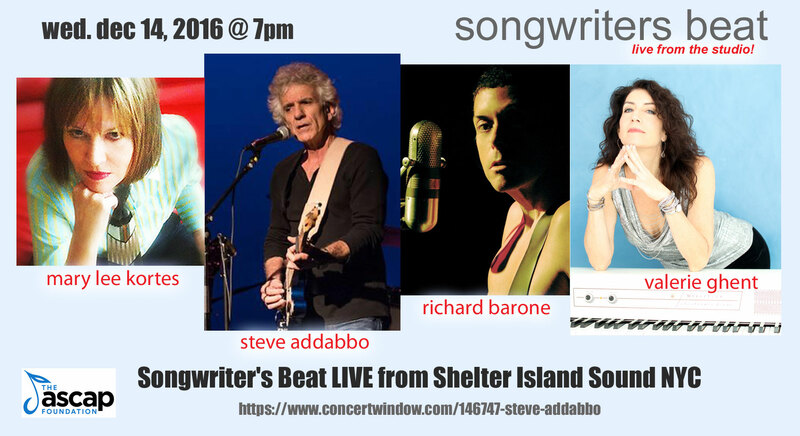 with acclaimed performing songwriters Mary Lee Kortes, Steve Addabbo, Richard Barone & Valerie Ghent. and listen via Concert Window! 4 Songwriters. New songs. Streaming live straight to your ears! December 2016 is the 16th anniversary of Songwriter’s Beat. Since our founding we have featured hundreds of songwriters, hundreds of new songs, bringing new songs to life and artists to new audiences. Special thanks to The ASCAP Foundation. Songwriters Beat – bringing new songs to life!